WINSTON-SALEM, N.C. (Jan. 30, 2019) - Three local companies will be searching for new employees at a community Job Fair at BB&T Ballpark on Saturday, February 23, from 10 a.m. to 1 p.m. Rhino Sports & Entertainment Services, Legends Hospitality Management, and the Winston-Salem Dash are looking to add to their teams. The Dash's 70-game home schedule begins on Thursday, April 11, and it will mark the 10th anniversary season in BB&T Ballpark history. The Dash have paced all 30 High-A teams in total attendance for the last two years. Single-game tickets will be made available on February 11, and fans can purchase theirs by calling (336) 714-2287 or visiting wsdash.com. 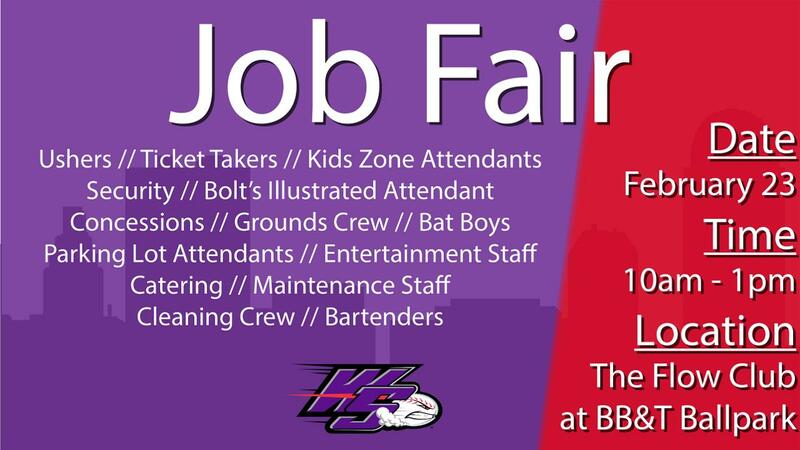 For more information on the Job Fair, call the Dash at (336) 714-2287.